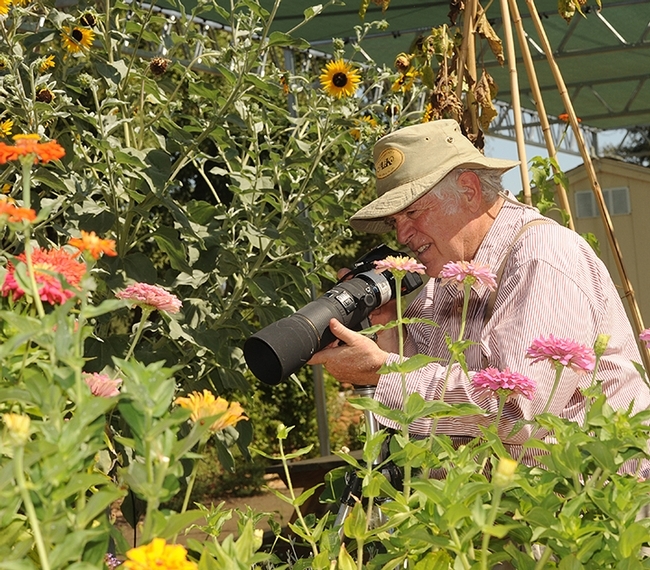 hotographer Allan Jones of Davis exudes patience, skill and talent from the moment he enters the Häagen-Dazs Honey Bee Haven, a half-acre bee friendly garden operated by the University of California, Davis, Department of Entomology and Nematology on Bee Biology Road. He pulls up a chair, mounts his Canon on his tripod, and adjusts the lens settings--and the trademark hat that shades his face. Allan Jones delights in not only capturing images of insects, but learning more about them, and sharing his finds with others. And on Saturday, Sept. 22, he will display many of his images at the Häagen-Dazs Honey Bee Haven open house, set from 11 a.m. to 2 p.m. The event, free and family friendly (and the last open house of the year), will include a catch-and-release bee activity, and a sale of bee plants and solitary bee condos (drilled holes in blocks of wood for bee nests, accommodating leafcutter bees and blue orchard bees). 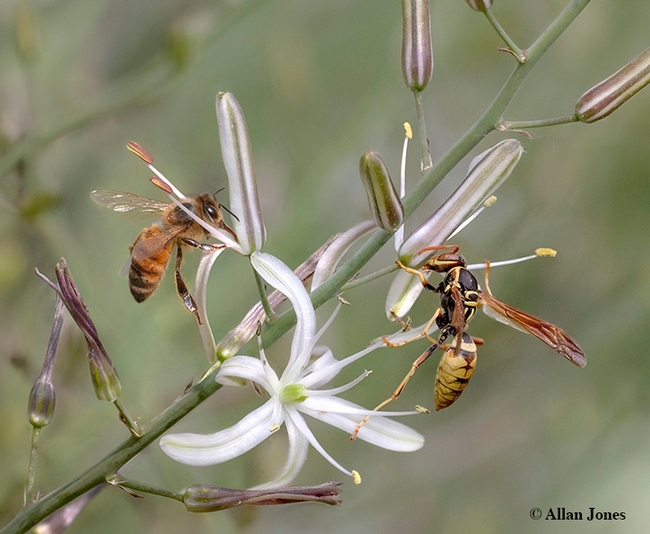 Plus, visitors will receive recommendations on what to plant for the fall to attract pollinators. 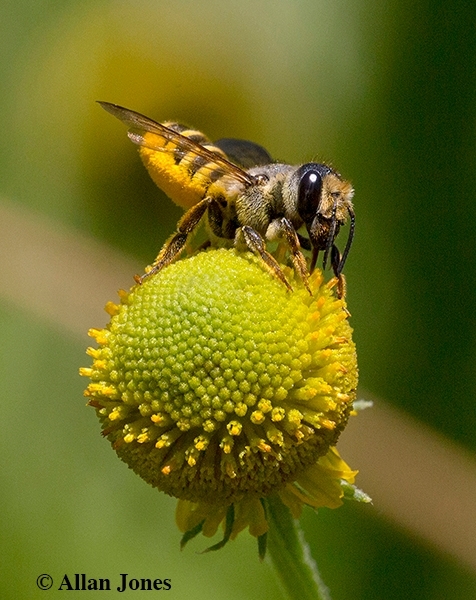 Jones will exhibit images of male and female bees of the same species, including a male and female leafcutter bee, Megachile fidelis, on sneezeweed, Helenium autumnale. “Working tomatoes six to nine months a year allowed me to pursue art and later landscape photography along the American River,” Jones related. “During the winter of 1982. I tried to capture glimpses of the American River in every light as the historic wild braided river it once was. The scenes are painterly, echoing the Hudson River School. When I moved from Sacramento back to Davis I turned to the UC Davis Arboretum, picking up macro shots to enhance a PowerPoint program I made for the Sacramento State Renaissance Society." Jones is a volunteer photographer for both the haven and the UC Davis Arboretum. He works closely with native pollinator specialist Robbin Thorp, UC Davis distinguished emeritus professor of entomology, who identifies and/or confirms his identifications. 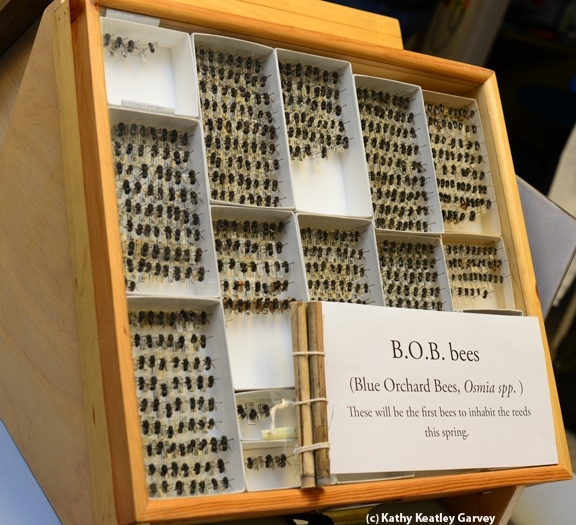 Thorp, who maintains an office in the nearby Harry H. Laidlaw Jr. Honey Bee Research Facility, co-authored Bumble Bees of California: An Identification Guide (2014, Princeton University Press) and California Bees and Blooms: A Guide for Gardeners and Naturalists (2014, Heyday Books). If you're yearning to be a backyard beekeeper, "go native." 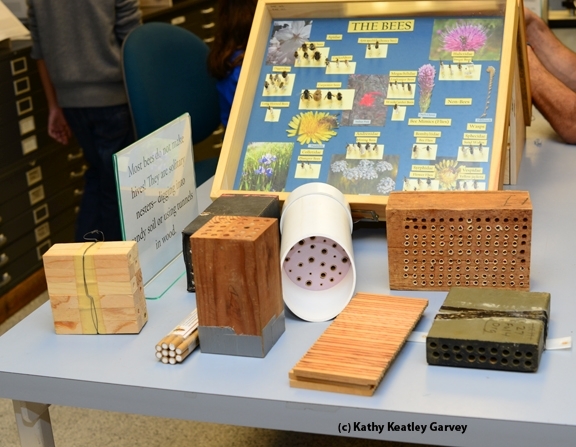 "Go native" with native bees, that is. 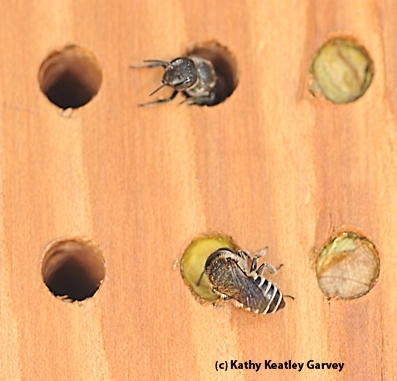 Many folks are building or buying bee condos to provide nesting sites for blue orchard bees (Osmia lignaria) and leafcutting bees (Megachile spp.). A bee condo is a block of wood drilled with specially sized holes for nesting sites. Bees lay their eggs, provision the nests, and then plug the holes. Months later, the offspring will emerge. 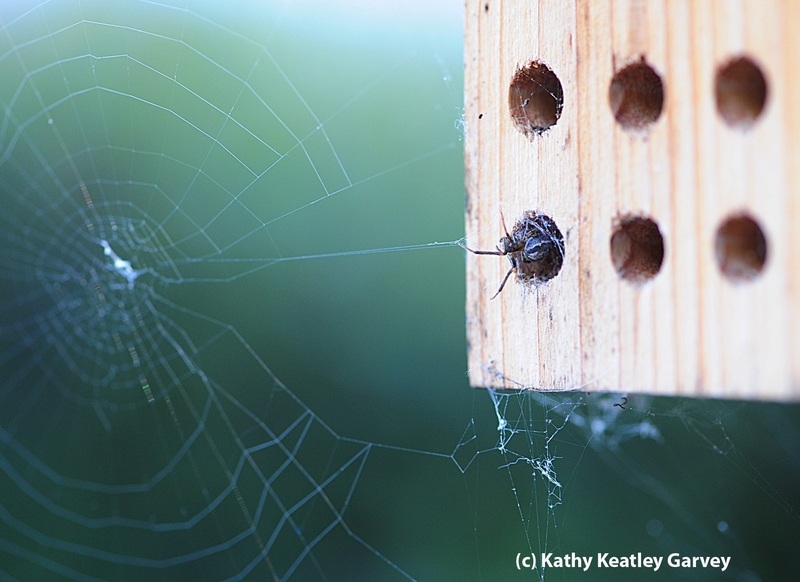 In our backyard, we provide bee condos for BOBs (short for blue orchard bee) and leafcutter bees. In the summer it's fun watching the leafcutter bees snip leaves from our shrubbery and carry them back to their bee condo. 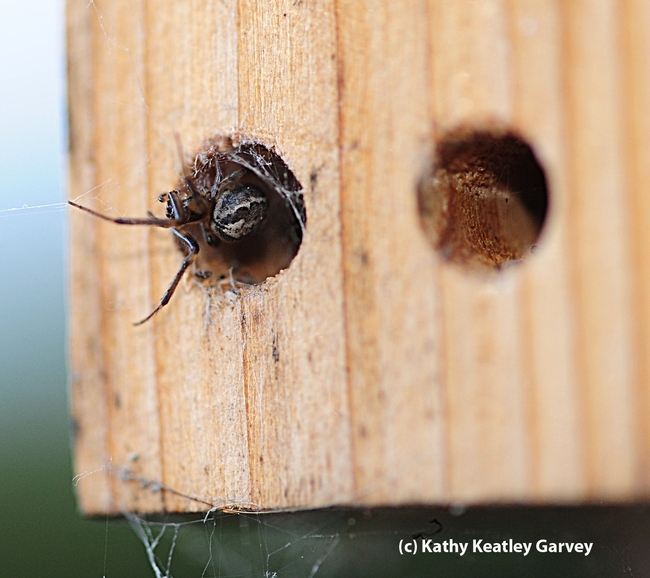 It's easy to tell the nesting sites apart: BOB holes are larger and plugged with mud, while the leafcutter bee holes are smaller and plugged with leaves. Osmia lignaria, a native species of North America, is sold commercially for use in orchard crop pollination. 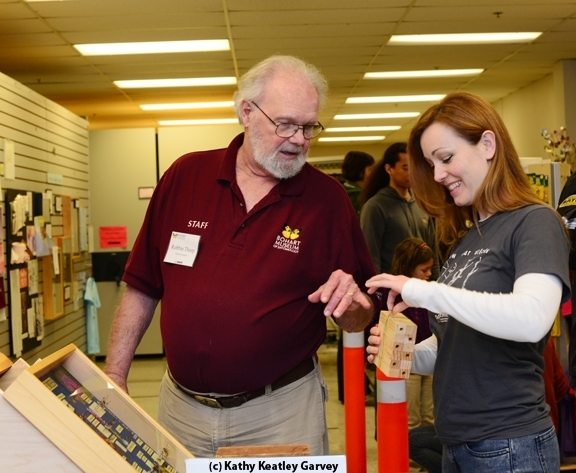 At the Bohart Museum of Entomology Open House on Sunday, March 2, native pollinator specialist Robbin Thorp, UC Davis emeritus professor of entomology, displayed a variety of bee houses. 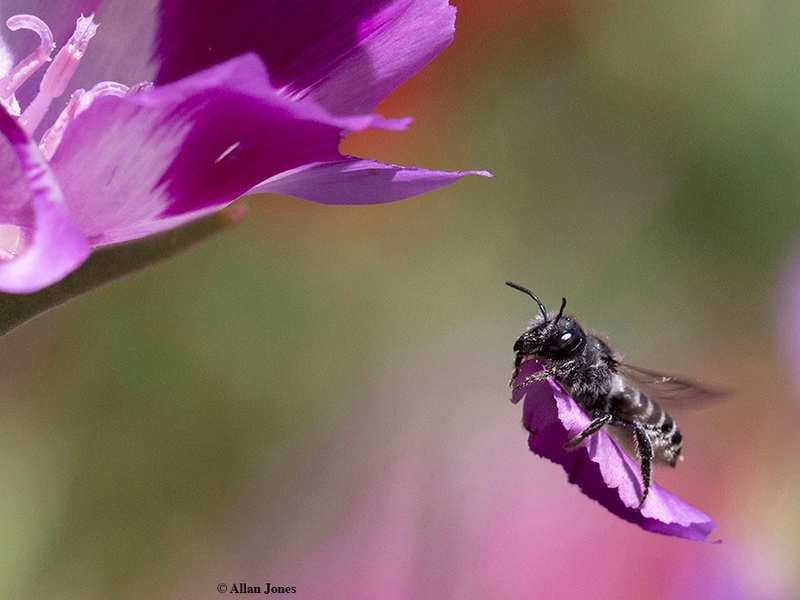 Better yet, if you'd like to learn more about native bees and their needs, be sure to register online for the Pollinator Gardening Workshop on Saturday, March 15 on the UC Davis campus. Hosted by the California Center for Urban Horticulture, it begins at 7:30 a.m. in Room 1001 of Giedt Hall and ends at 2 p.m. with a plant sale at the UC Davis Arboretum Teaching Nursery and a tour of the Häagen-Dazs Honey Bee Haven, a half-acre bee friendly garden on Bee Biology Road, west of the central campus. For the small fee of $40 you'll receive a continental breakfast and box lunch and return home with an unbee-lievable wealth of knowledge. 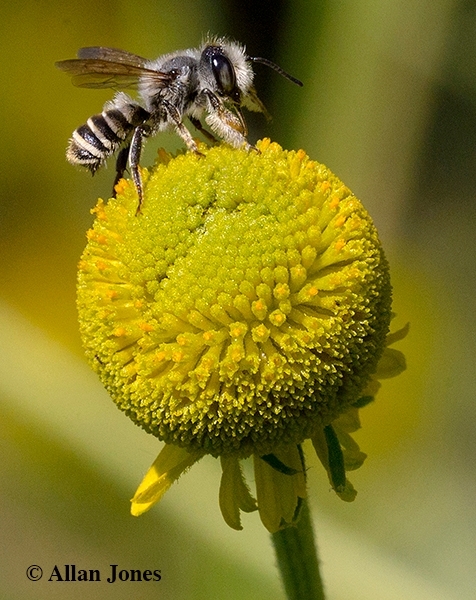 Speakers will include several honey bee and native bee experts: native pollinator specialist Robbin Thorp; pollination ecologist Neal Williams and Extension apiculturist Eric Mussen. See the complete list on the website. You'll be hearing from Robbin, Neal and Eric, but you'll be thinking about BOB. You can't always choose your tenants. 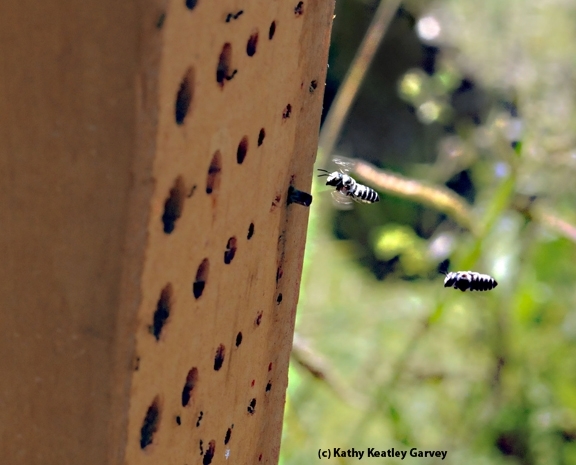 Take the case of our two bee condos, which are blocks of wood drilled with holes for native bee occupancy. One, with the smaller holes, is for leafcutter bees (Megachile spp.) The other, with the larger holes, is for blue orchard bees (Osmia lignaria), fondly known as BOBs. 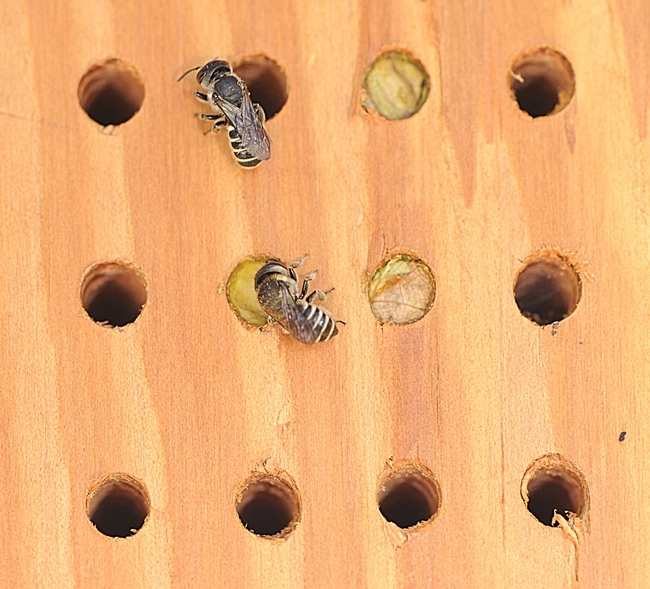 The leafcutter bees were the first to occupy the bee housing. At one time we had 16 leafcutter bees and one earwig. The blue orchard bee condo now has three tenants: two BOBs and one spider. The webweaving spider spun its web and then crawled into the hole for the night to wait for morning. And to wait for unsuspecting prey. That's how many tenants are occupying our wooden bee block, aka "bee condo." It's "home, sweet home" for leafcutting bees (Megachile spp.). 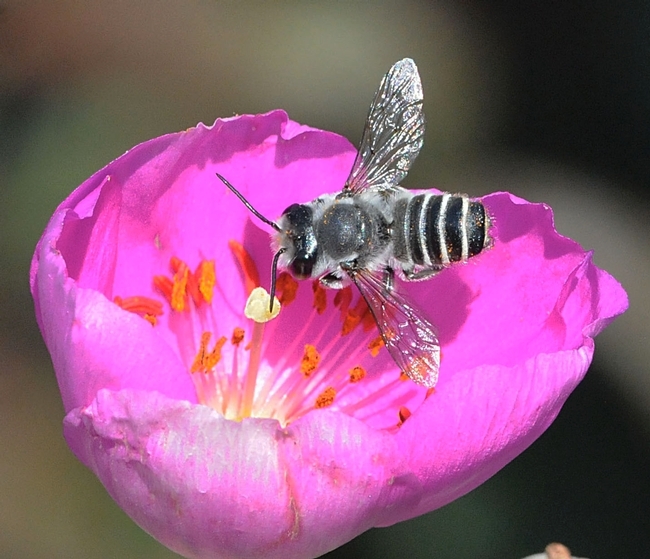 Daily we see these native bees tear holes in leaves (red bud, rose, catmint, gold coin, rock purslane and nectarine) and gather the fragments to line their nests. Folks who grow prize-winning roses--the kind that win blue ribbons at county fairs and rose shows--aren't fond of these little critters, but we are.